For proper segregation of system and data, you want to move a user profile from the boot drive to another hard disk. Windows however does not think this should be easy. It is usually not possible to move user profiles under Windows. You thus have to use a trick to move the profile data to another location of your choice and let Windows continue to believe that everything still is where it should be. For this, set up a junction (connection). The prerequisite for this is that you are using the NTFS file system. Since the following steps are not reliable with Windows already running, start the system with the installation DVD and follow the steps up to the language selection. Use the key combination [Shift]+[F10] to open a command line window. Check the individual drive alphabets with ‘dir’ because they might become different from the normal assignments in Windows. 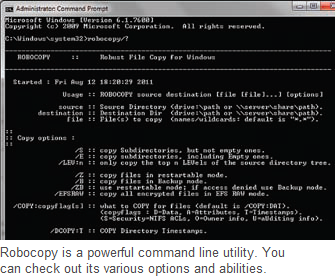 Then copy the existing profile data to the new location via ‘robocopy’. The options you will need might include ‘/mir’ for a complete transfer of the directory structure, ‘/ sec’ for copying the security information and then ‘/xj’ for excluding the existing junctions. Since it is not very practical to move one single user profile and to leave the rest of them on the system disk, use the action for the entire folder ‘c:\users’. The command should then be robocopy c:\users d:\Newusers /mir /sec / xj if you want to save the profiles under ‘d:\Newusers’ for instance. Here, you must delete the original folders completely with the command rd c:\users /s /q. Then create the required junction in the file system with mklink c:\users d:\Benutzer /j. Then close the command window and cancel the Windows setup. Windows can now start normally and uses the profiles from the new location. Note: The new path must be available at all times. If you need to restore the system for instance, the action cannot be undone. In order to bring the user profile back to the original location, you need to undo the specified steps in the same manner. For this, first delete the junction using the command rd c:\ users. The real data at ‘d:\Newusers’ is retained and can be copied to ‘c:\users’ on the system drive.